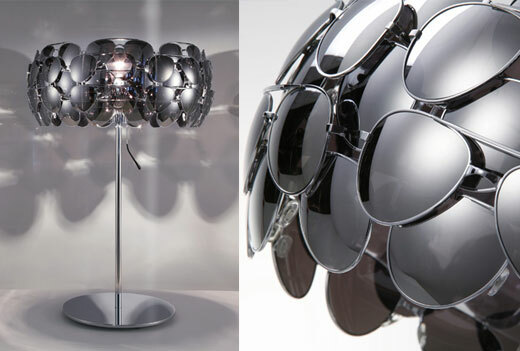 A lamp shade made of 40 mirrored aviator glasses, inspired by celebrities who never take their shades off. When switched on, the lenses become translucent and cast oval shades all over the surrounding walls. 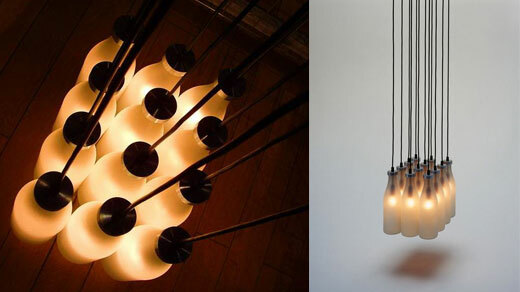 Tejo Remy designed the Milk Bottle Lamp Chandelier for Droog Design in the Netherlands. 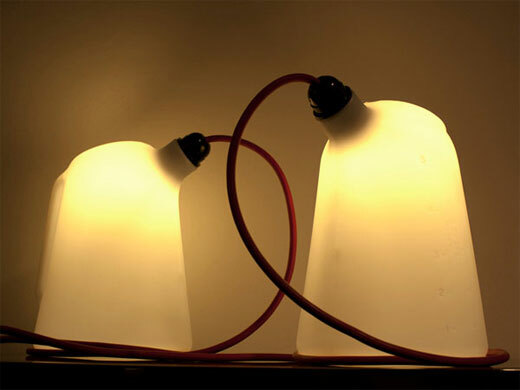 The Milk Bottle Lamp is a classic in the history of modern lighting. The milkbottle chandelier is a cluster of 12 old-fashioned milk bottles. The bottles are sandblasted and have a chrome top. The milk bottles hang on long cables, 12 at a time – three rows each of four bottles, just like the Dutch milk crate in the old days. 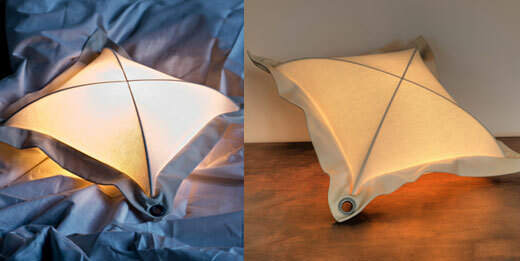 Designed by St. Louis, MO artisan John Beck, this steel sheet lamp shade can send a message. 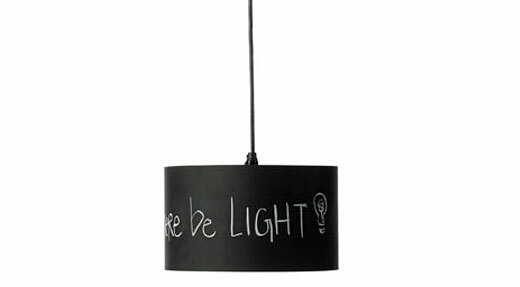 Beck’s minimalistic lighting fixtures are made of 95% recycled steel. Since they come in three different sizes, you can choose exactly the right one for your child’s room, kitchen or living room. Each lamp is made by hand in John Beck’s studio in St. Louis, MO. 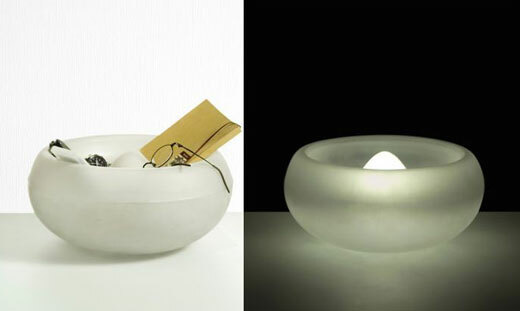 University of Art and Design (ECAL) graduate Vanessa Hordies created a bedside lamp called Night Night. The prototype has a wooden base and a glass top. 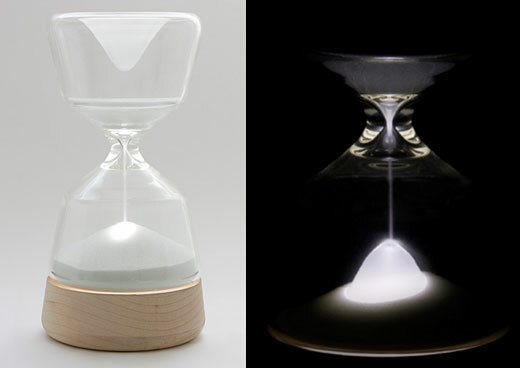 Once inverted and a button is pushed, the light stays on for fifteen minutes as sand gradually trickles down to cover the light while the user drifts off to sleep. The 05.L, named after the repurposed can that makes up its shade, is a lamp with a straightforward design; a 9W energy efficient lightbulb, recyclable shade, and bulky red cord. With only 3 major elements the 05.L is for the user who wants to keep things uncomplicated. ‘Nuff said! A modular light system that responds to touch: through the electromagnetic fields of the human body. 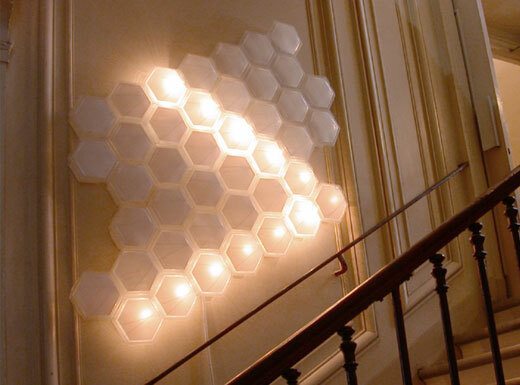 The hexagonal units can be assembled in any shape and modulated to compose multiple lighting situations. Light Brix is architecture composed by light. Linas Kutavicius’ Light Pillow is all about warmth and softness. 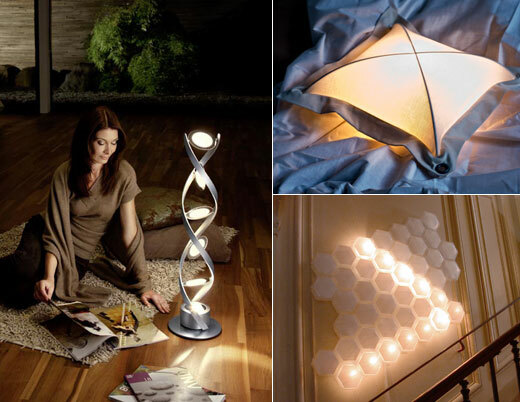 This pillow shaped light can be placed on the floor (or bed), hung on the wall or used as a chandelier. 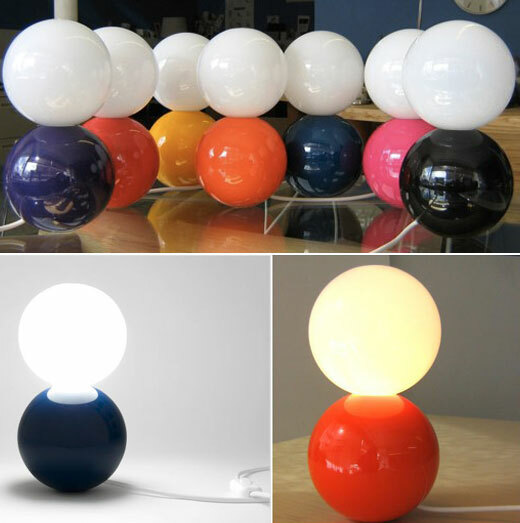 Any way you use it, you’re sure to have a unique lamp. LifeGoods’ dual purpose bedside lamp takes care of all that clutter. It is both a catch-all storage and a lighting solution for the bedroom. Bakelite lamp is made from the first ever heat and solvent resistant plastic, the material that was a major factor in the growth of the automotive industry and was used in the ubiquitous black telephones from the early 1990s. 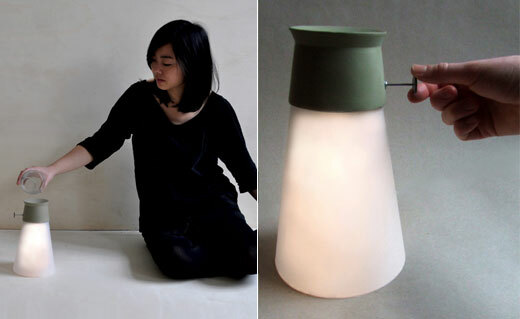 To power this self sufficient ambiant lamp, only a few drops of water are enough. Energy is produced by an hydro-electric battery composed of a carbon stick coated with magnesium powder. 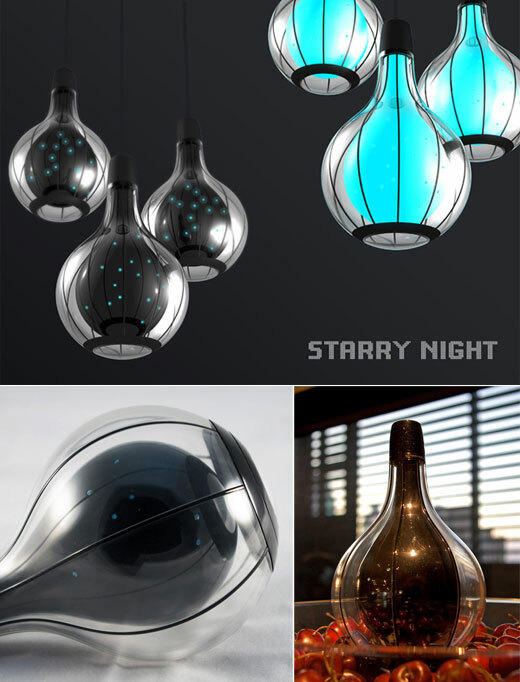 The water generates an electro chemical reaction that generates light. 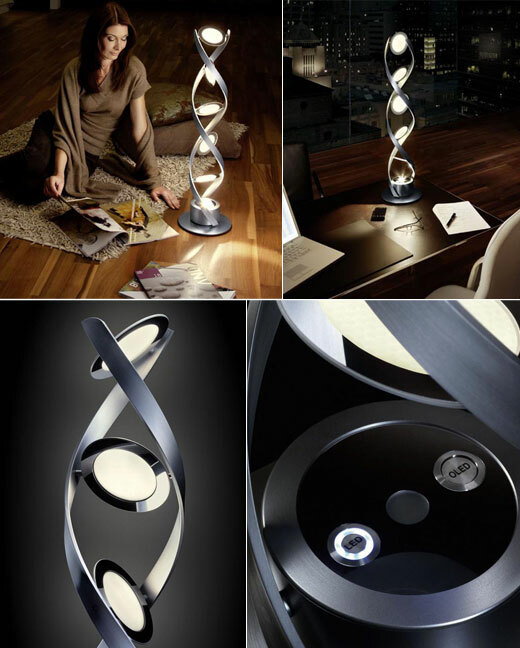 Created with a special technology, the PirOLED creates a relaxing atmosphere that will guide your reading or working schedule while shining a candle flame resembling light on any chosen surface. The innovative design and intelligent combination of OLEDs and LEDs make the PirOLED from OSRAM a necessary, contemporary addition to your home or working space. A warm white light complements the brushed aluminium frame and a set of thin discs can be individually adjusted to create the perfect mood.